The European Commission’s latest Quarterly report on electricity markets makes sobering reading down under. Over the last year wholesale electricity prices have been falling just about everywhere across the developed world except here in Australia, where they are skyrocketing. Australian prices are now above the European average, well above the US and rapidly converging with Japan, which is still recovering from the shock of Fukushima in 2011 when prices rose to over eight times Australian. With Japan now reactivating nuclear power production, and Australian LNG exporters putting the squeeze on domestic gas markets, it can be anticipated that Australia will soon be top of the price tree. Indeed, with 2016 Q2 and Q3 Australian prices rising at unprecedented rates, it probably already is. Combined with exorbitant power distribution costs, the alarming trends highlighted by the EC’s report will be exercising the mind of our new Federal Minister for the Environment and Energy, Josh Frydenberg. How fast are Australian prices rising? The trends highlighted by the EC’s report are expressed in Euros, so they somewhat obscure local dynamics. In reality, Australian wholesale prices are rising more steeply than ever before, having risen by around 45% over the last year. Prices over the last six months are now higher in aggregate than at any comparable time during the carbon tax period, which added around 50% to wholesale prices in the period 1/07/2012 – 17/07/2014. When the impact of the carbon tax on 2014 prices is removed, prices are up by more than 65% in just 2 years. Wholesale prices averaged by season, on the Australian National Electricity Market (NEM) from spring 2009 through to winter 2016. 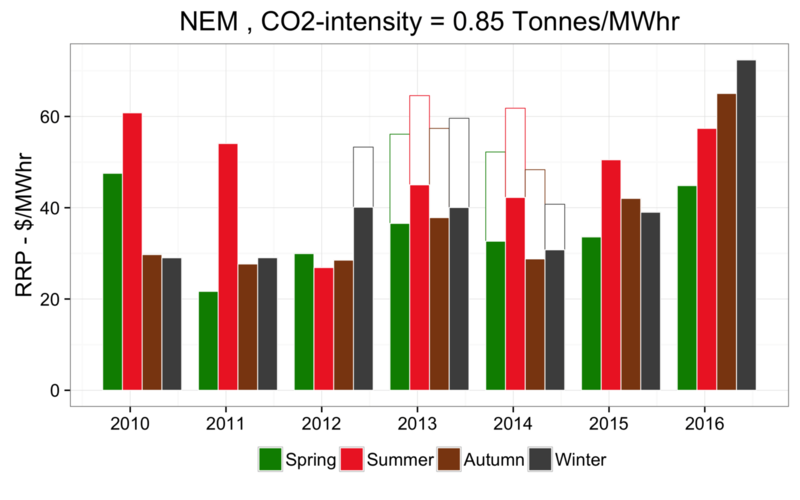 For the carbon tax period 1/7/2012 through 17/7/2014, filled coloured bars show the prices with the carbon tax component subtracted, assuming an emissions intensity of 0.85 tonnes per megawatt hour. Actual prices for this period are shown by the open lines. Data sourced from AEMO half-hour aggregated price and demand datasets. 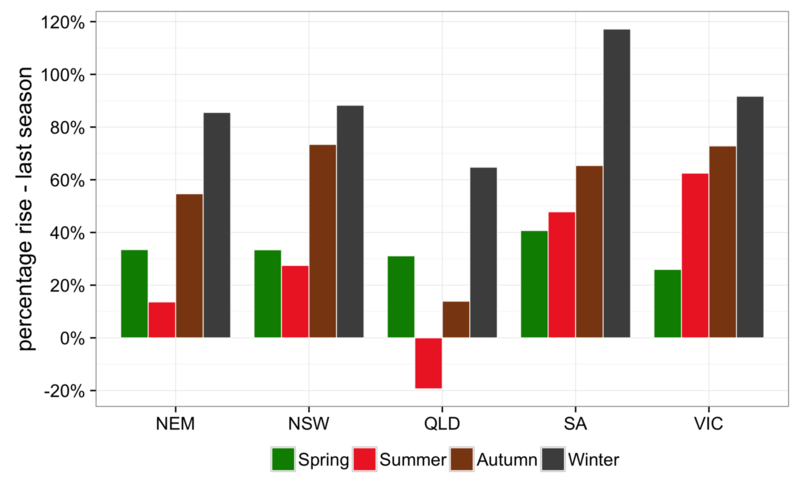 Compared to the same period one year earlier, wholesale prices have risen across all seasons and all jurisdictions in the last year, excepting summer in Queensland. The rate of increase has risen steadily from the spring 2015 through to the winter 2016. For the winter period of 2016, prices were up by an average by 85% compared to the previous winter, with the increase ranging from 65% in Queensland to 115% in South Australia. Annual percentage changes in wholesale electricity prices on the National electricity market. The prices are calculated for the Spring of 2015 through Winter of 2016, compared to the same period one year earlier, for each of the mainland regions comprising the NEM. Data sourced from AEMO half-hour aggregated price and demand datasets. 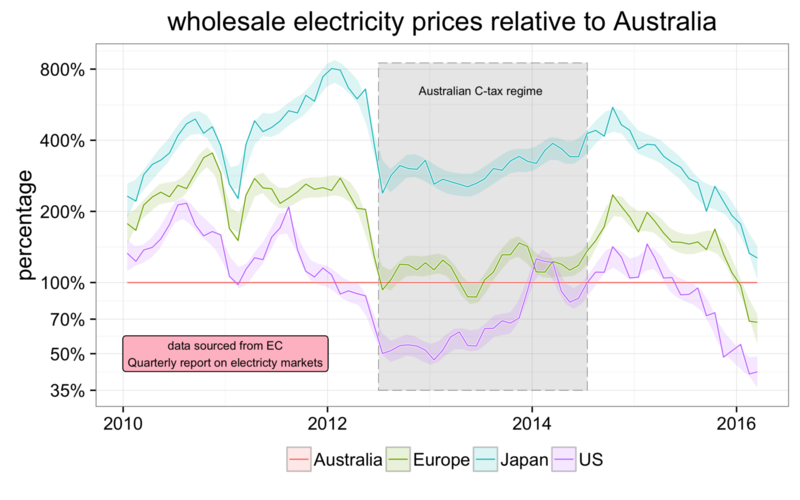 Why are electricity prices falling everywhere but Australia? 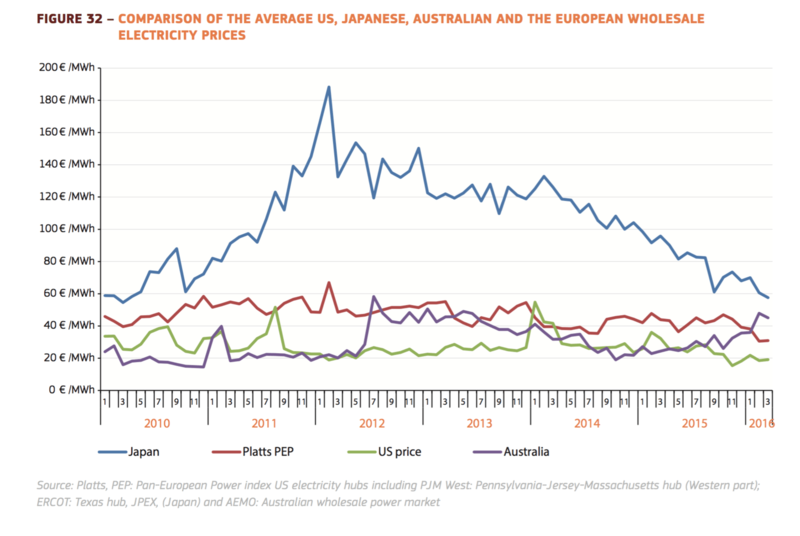 The reasons for wholesale electricity price falls in Europe and Japan are straightforward. Both are dependant on imported gas, and with the oil-linked price for gas falling, so too are electricity prices. In the US market, the flood of shale gas greatly exceeds export capacity, so there is a continuing glut of cheap gas . The story in Australia is quite different. Despite a three fold increase in gas production in the last few years, due to the opening up of new coal seam gas (CSG) fields in Queensland, the Australian domestic market is being squeezed as LNG exporters struggle to meet supply contracts. In the Australian CSG industry it is an open secret that some exporters agreed punitive clauses in contracts should they fail to fill their LNG trains. Despite strong opposition from former industry champions such as John Ellice-Flint, exporters such as Santos stretched themselves on production by committing to two LNG trains. Now gas is being diverted from domestic markets to avoid industry collapse. The consequence is that Australian gas consumers are increasingly subject to scarcity pricing when domestic prices can rise to many times that which international buyers have contracted for the same gas. Not surprisingly, steep rises in the cost of gas is causing a reduction in gas use in domestic electricity markets. In Queensland gas fired power output in the winter of 2016 was down about 250 megawatts or 20% on the year before. Meanwhile black coal generation was up 450 megawatts, with Queensland’s CO2-production from the electricity sector increasing by 5%. An insight into the impact of the rising cost of gas on our electricity market is provided in the figures below, which show how market prices varied with gas dispatch in Queensland over the winters of 2015 and 2016, respectively. In winter 2015, when gas dispatch averaged 1076 megawatts, there was no correlation between wholesale prices with the amount of gas dispatch, consistent with gas generation being a price taker. Then the average price of electricity was $39.6 per megawatt hour. By winter 2016, when gas dispatch averaged 833 megawatts, a strong price correlation had established as gas generators increasingly set the price. Average prices had risen to $65.2 per megawatt hour with spot prices increasing almost $100 per megawatt hour for each additional gigawatt of gas dispatch. 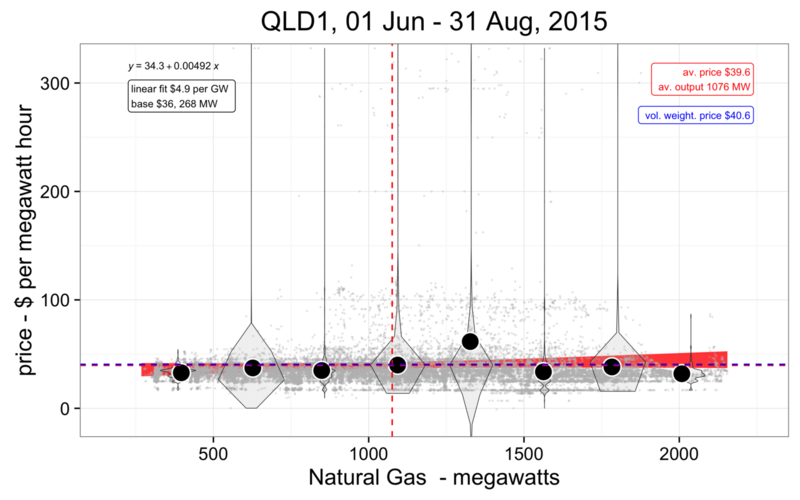 Pattern of market prices with gas dispatch in Queensland in winter, 2015. Abundant ramp gas during this period caused electricity prices to decouple from gas use. The grey points represent individual 5-minute dispatch intervals. The violin plots show the distribution of price event for 8 different gas dispatch bins, while the black circles show the means for each of the 8 bins. The red shade shows the linear fit to the 5 minute data. Data sourced form AEMO 5-minute dispatch tables. 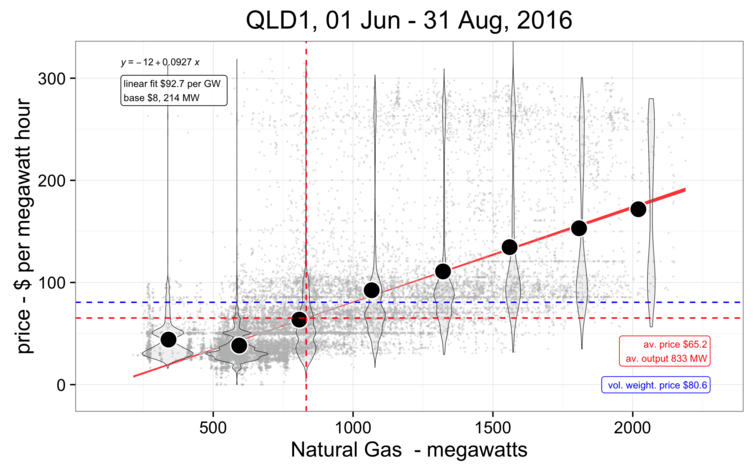 Pattern of market prices with gas dispatch in Queensland in winter, 2016. Gas scarcity in the domestic markets during this period meant there electricity prices were strongly coupled to gas use, with prices rising on average $92/MWhour for each additional gigawatt of gas dispatch. Data sourced form AEMO 5-minute dispatch tables. In 2015, the availability of “ramp” gas made Queensland settings somewhat analogous to the US, where cheap gas increasingly fuels electricity generation. By winter 2016 when more LNG export trains had been commissioned, scarcity pricing was manifesting in our domestic gas markets impacting our electricity market big time. As the EC’s quarterly market report flags, the historical competitive advantage Australia has had as a cheap provider of electricity has been obliterated in a little over a year. And that is without any carbon tax. It is hurting most severely in South Australia which has always been more exposed to gas prices than other states by virtue of its limited coal reserves. While several compounding factors have played out in extreme electricity price rises in South Australia, as discussed in my last post, the broader rises across Australia have their underpinnings in the rising domestic gas market prices as well as contractual arrangements in gas piping. The smoking gun is the resent steep rise in Queensland electricity prices – a market that remains essentially a renewable free zone. One might ask why such energy users exposed themselves to spot (wholesale) pricing (the norm is via the contract market). Whatever, the cautionary is that 14 MW represents 1% of average South Australian power consumption. Ten such business at threat of going under would be devastating, with potential to reduce South Australian electricity demand by 10%. The horse has bolted, so what next? The EC’s quarterly market report was already flagging in Q1 2016 that Australian electricity production was expensive by international standards. Since then, further steep price rises across the NEM in autumn and winter 2016 have further exacerbated price differentials, surely now placing Australia amongst the most expensive producers of electricity in the world. No doubt the gas lobby will absolve the industry from any responsibility for the recent events that have transpired on our electricity markets, arguing the solution lies in even more gas production, and that renewable energy policies are more to blame. To be sure, eastern Australia is short on supply of cheap conventional gas from the offshore Gippsland Basin and a few other locations. Expanding the gas base by exploiting unconventional resources such as CSG was always going to come at a price, since such resources are inherently more expensive. The hope is that the events of 2016 are transients, related to temporary development schedule difficulties. If they are not, then god help domestic consumers, not just those exposed to electricity prices but also right across the gas sector. A broader question for our gas exporters is just how much risk from any such development schedule difficulties is appropriate to defray onto domestic consumers? As the Eastern Australian Gas Markets Study highlights, it is not as though such circumstances were not anticipated. In prosecuting the case to deliver more of our national gas resources to market, perhaps it is not too much to ask that domestic gas consumers are offered some insurance against any further development schedule difficulties incurred by our exporters? After all, it is our gas. Domestic reservation, anyone? – at least while transitional issues work through the system. Mike Sandiford is Professor of Geology at the University of Melbourne. His research interests include tectonics, earthquake geology, geomorphology and geothermics. His work on the thermal structure of the Australian crust provides a framework for understanding the extraordinary abundance of Uranium in Australia, and helped promote interest in geothermal energy exploration in South Australia. He has published over 170 peer-reviewed scientific papers and supervised more than 80 young researchers at Honours, Masters, PhD and junior postdoc level. He was recipient of consecutive ARC professorial fellowships (2000-2009), the Mawson Medal from the Australian Academy of Sciences in 2004 (for outstanding contributions to Australian Earth Science), the Hobbs Medal, the Carey Medal and Stilwell Medal (three times) from the Geological Society of Australia. He is a fellow of the Australian Academy of Science and the Geological Society of Australia. He chaired the Science Advisory Framework for NCRIS geoscience capability AuScope. He directed the Melbourne Energy Institute at the University of Melbourne from 2009-2016. Horse has bolted, so, mitigation time. Salient example: our NSW power (Powershop) has gone up 10% in a few months. So, we just put solar HW (thermosiphon) in as the 36 (!!!) year old Rheem rusted out (due to TLC and sacrificial anode, I think). Anyway, our power usage has dropped 30% in 2 weeks. System is on our TOU meter, and CL2 has been decommissioned. Solahart is offering 50months interest free – if people are able, highly recommended. Our hot water was 40% of the bill, and this is much better bang for buck than solar PV. Just a personal example of mitigating this cartel. For me this is a rather obvious outcome. In the first instance Aussies need to admit they screwed the pootch, unfortunately it’s not something that can easily be undone but at least we can start the process. At the risk of mixing my metaphors you’re asking the electricity industry to unscramble the eggs and expecting this to be done on their dime. Worse still you dis experienced industry insiders and wonder why those knowledgeable individuals/engineers (with the skills to run the industry efficiently) are no longer willing to play your games. Beggars belief. No it’s all this climate change nonsense. Time to bring back Tony Abbott, he’ll save us! You sound like you would like to take NEVA ‘Gas edition’ for a test drive. I will even give you a discount for both the iron ore and gas edition. At least high energy prices are a good incentive to push more people onto energy efficiency drives and renewables (home solar PV). Not the most efficient way to acheive things though. I’ve developed a strange obsession with getting my energy bill to zero. No matter how much it costs….. Does anyone have old electricity bills? 10-15 years old? I just wonder how much electricity retailed for back then. It was around 10 cents per kW hour for a long time.